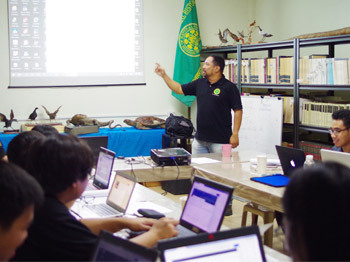 Around 50 participants of the second session of the two-week “Training on Wildlife Conservation and Management” engaged in birdwatching last August 24, 2018 at the College of Forestry and Natural Resources campus. 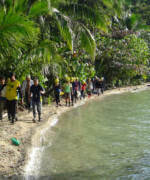 The activity was part of the training designed to increase the DENR’s regional wildlife protection officers’ recognition of birds in their natural habitat. 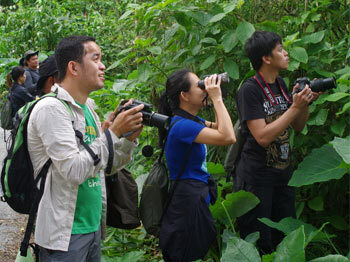 With the help of staff and volunteers of the UPLB Museum of Natural History, trainees tried to identify different bird species observed in the Mount Makiling Forest Reserve. As early as five o'clock in the morning, the trainees gathered at the Museum of Natural History to start their hike through several observation stations determined by the Museum personnel. The activity was to be done very early since most birds are typically more active after sunrise. Some of the stations included the CFNR Arbor Square, UPLB-EDC Binhi Biodiversity Park, the TREES parking lot and the several areas inside the Makiling Botanic Garden. SEABCO 2018 is an international conference initiated by the Southeast Asian Bat Conservation and Research Unit (SEABCRU) in partnership with the Philippines Biodiversity Conservation Foundation, Inc. (PBCFI). The conference convened bat researchers, experts, conservationists and students from over 14 countries worldwide, mostly from the southeast Asian region. 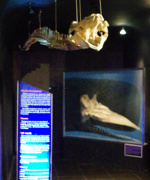 The conference included student and expert presentations on seven different themes: species diversity and monitoring surveys, cave bat ecology and conservation, bats in disturbed landscapes, acoustics, bat-plant interactions and flying fox conservation, bat-arthropod interactions, and taxonomy, systematics and evolution. Posters on different aspects of bat taxonomy and ecology were also presented. Around fifty personnel from the 13 regional offices of the Department of Environment and Natural Resources (DENR) as well as the DENR-Biodiversity Management Bureau (BMB) are now attending a "Training on Wildlife Conservation and Management: Species Identification, Handling and Management Techniques of Amphibians and Reptiles with the assistance of curators, staff and students affiliated with the UPLB Museum of Natural History (MNH). 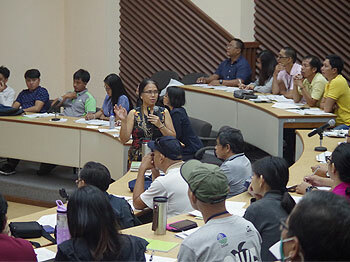 The training, being held by the DENR-BMB with the generous funding support of the USAID Wildlife Protect Project, commenced last 31 July at the SEAMEO-SEARCA headquarters here in UPLB, College, Laguna will conclude in two weeks. 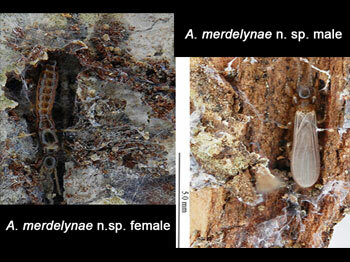 A new species of web spinner (Embioptera) was recently discovered from foothills of Mt. Makiling and is named Aposthonia merdelynae. 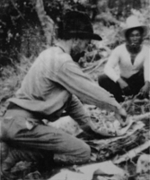 The species was named after Dr. Merdelyn Cassi-Lit, wife of the former MNH Director Dr. Ireneo L. Lit, Jr, for "her contributions to the knowledge of insect-plant interactions". Embioptera are small insects with silk glands in their front legs for creating silken galleries where they live in. "In Mt. Makiling, they are commonly found nesting on bark trees", Lucanas described. A. merdelynae is the third member of the genus that is native to the Philippines. 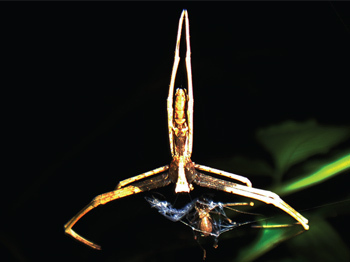 In an article released online by The Philippine Entomologist (Vol 31, No. 1), UPLB MNH curators Dr. Aimee Lynn A. Barrion-Dupo and Dr. Alberto T. Barrion discover three new species of Deinopidae and the record of its type genus Deinopis Macleay, 1839 in the Philippines. Ogre-faced spiders (Deinopidae) is a small family of spiders which specialize in casting an expandable silk mesh to catch small insects. According to the authors, these spiders have distinctly large front eyes resembling those of ogres that give them a monster-like appearance. They are also called "net-casting spiders" because of their behavior in capturing prey. A lack of online presence can severely limit a person’s visibility in today's technology and information-driven world. This is very true especially for scientists, researchers and even young professionals who are trying to earn their place in the academe. "Using social media and networks to improve your online visibility and at the same time highlight the things you are working on may not be enough for you to get noticed," said Florante A. Cruz, a development communication practitioner from the UPLB Museum of Natural History replied when asked on why the Museum decided to hold a training recently on e-portfolio building for several graduate students.